This Thursday it’s all about flowers. For as much as I love throwing in questionable photos of borderline weedy plants or offensively tacky color clashes, even I have to brag a little now and then when something goes right. The tall hybrid delphiniums don’t like my garden or me but this one seems to have resigned itself to its fate and has come to an agreement with my garden. It’s beautiful and although I can take little credit for that at least the pictures are pretty. Four years ago it was love at first sight when I came across a little pot with a fat plant and a solid stem just starting to sprout up into a bloom stalk. I thought to myself “even I can’t screw this up, and it’s going to be amazing”, so onto the cart it went and the rest is history. These tall delphinium hybrids love a perfectly rich soil in a sheltered spot with steady moisture and shelter from the worst of the weather. They do better in cooler, fairer climates and don’t like drought, heat, humidity, storms, drying winds, children playing, large pets, neglect, stray hoses, clumsy gardeners… essentially everything that my garden represents… but this one carries on. 2016 has been a lean year for it since I’m trying something new (less fertilizer and no staking) but the show is still nice enough. A wider view of the clump shows smaller bloom heads and yellowing lower leaves which resulted from a leaner diet, but I also haven’t staked the flowers and they are holding up reasonably well to the wind. But you don’t care about lean, anemic delphinium plants. A Thursday feature is fun so here are photos from last year when the fertilizer was flowing and the party really took off! Sorry about the bicycle in the background…. This one clump which survives (trust me I’ve killed my fair share of these) is on a slope in morning sun near the hose… which means it gets a sprinkle whenever the water goes on. …and oops about the sign. -but prepare yourself for heartbreak if you give these a try. 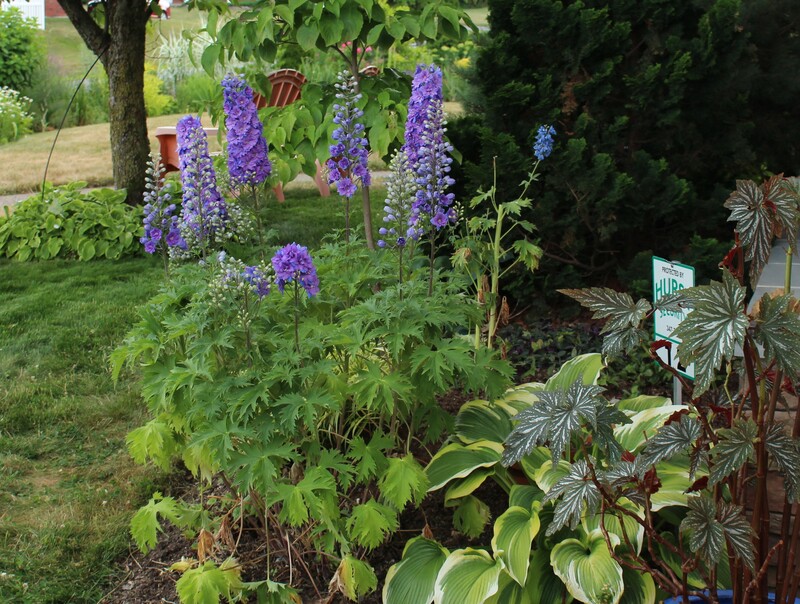 Three out of four years a storm cell will pummel your garden just as the delphinium reaches its peak, and little in the way of staking will help the heavy blooms. On the plus side they make an excellent cut flower (if you have room for two to three foot flower stalks in your arrangement), but on the down side it’s depressing to say the least. Few things are fun without a little effort and risk, so give them a try and see where you end up. While I go on to ponder the possibilities of growing these in a classy walled garden with the perfect soil, you may want to check out a few other feature plants to fill your Thursday. Kimberley of Cosmos and Cleome hosts each week so give her blog a visit to see what she and others have featured this week. This entry was posted in cut flowers, early summer, perennials, thursday feature and tagged cut flowers, delphiniums, perennials, Summer. Ooh! That’s just an amazing plant, Frank! I’m so jealous of anyone who can grow delphiniums to begin with, but this one takes the cake! You know wha? 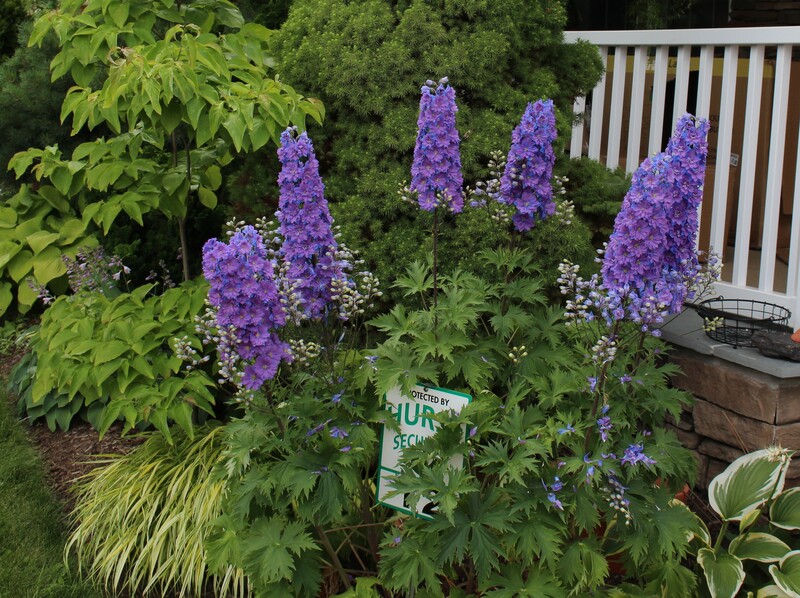 The Rutgers Cooperative Extension lists Delphiniums as “Seldom Severely Damaged” by deer, so perhaps I’ll try one out in the Terrace Garden where the woodchucks (so far) don’t seem to venture. You’ve got me cogitating, and that’s a dangerous thing! Thanks for joining in! 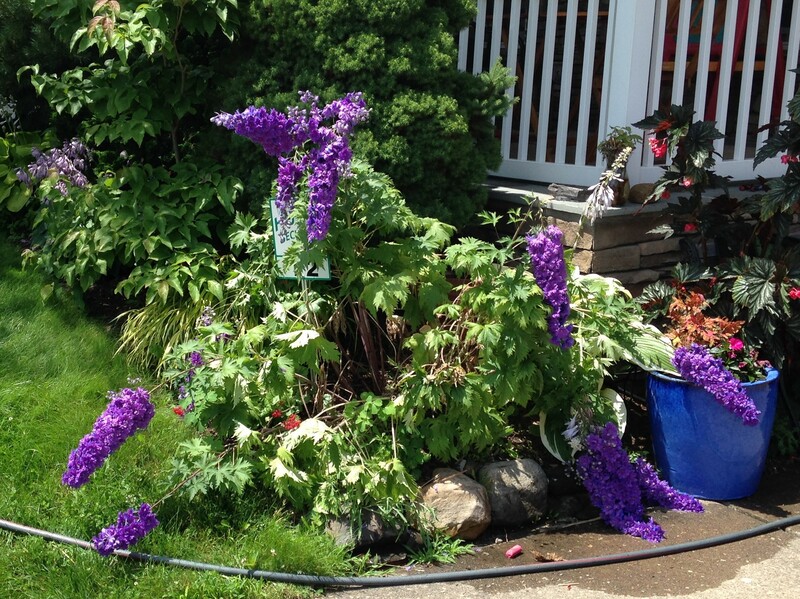 Oh yeah, upstate NY is probably right into the range of excellent delphinium weather, and probably a bunch of other cool summer loving plants. It’s just such a short growing season…. With one exception, I don’t grow Delphiniums because I’ve always thought of them as being very fussy. Yours look great, though they did suffer in the storm. You forgot to mention that they also don’t like loud music and ice cream trucks that blare “Turkey in the Straw”. I have one wild Delphinium – D. exaltatum – it hasn’t bloomed yet. I look forward to seeing your delphinium bloom! I didn’t know there was a native East coast delphinium. I bet it’s much more tolerant of a lot of the weather which the hybrid ones dislike. Out west I saw a few growing wild in the mountains. It’s amazing to think they just go about doing their thing without even the slightest tinkering from humans. It always seems like a plant which must be pampered. Delphinii are beautiful in bloom. Why, oh why, haven’t I ever been able to grow them? Mine always want to lie down and take a nap. So…I don’t try anymore. John I’ve killed my share of delphinii as well. They just seem to melt away in the heat and never forgive summer for heating up. Absolutely beautiful. Delphiniums don’t fare well in this area although I’ve tried them anyway to no success. Your blue beauties are an inspiration to us Defeated Delphinium Dreamers! 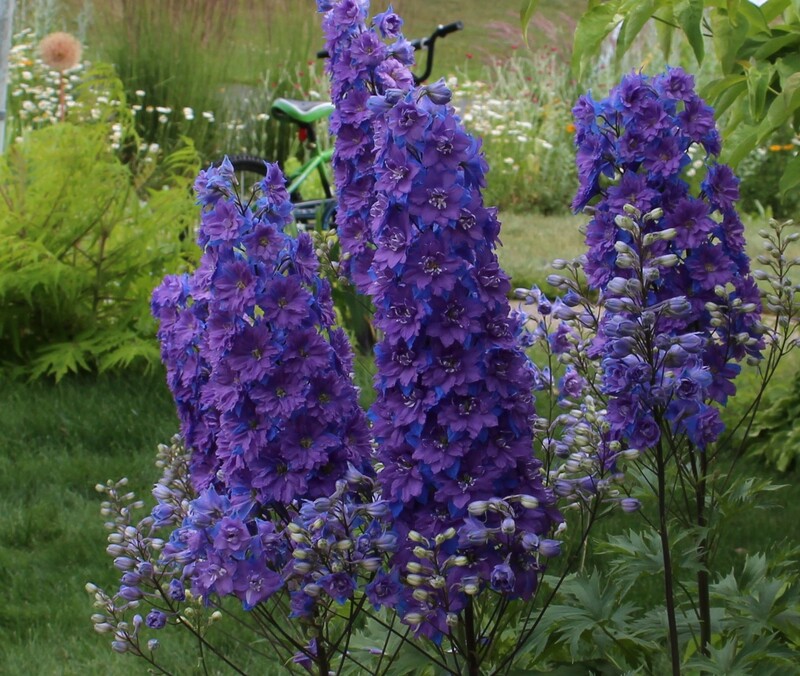 I ADORE delphinium, but I would never even think of torturing such a lovely plant by subjecting one to the climate of Coastal Georgia – we have all the things it hates! I did love them in CT, but even there, they gave me a hard time.. So glad you found one that performs so well !! There’s something about the huge blue spikes that makes you want to try again and again, but if you can grow perfect camellias, gardenias, azaleas, crape myrtles, hydrangeas…. I bet you don’t miss them too much! These are magnificent. I also have a clump of them but white ones. I do not stake them but I believe that the clematis that grows through them helps them. I did not intent to have the clematis grow through them initially but it did and now I encourage it to so so. Now that’s an idea! The only question is what color…. I bet a white one wouldn’t look too bad with my purple delphiniums. Too bad we can’t do a delphinium exchange program. I wouldn’t mind adding a little variety yet my plant never sets seed. 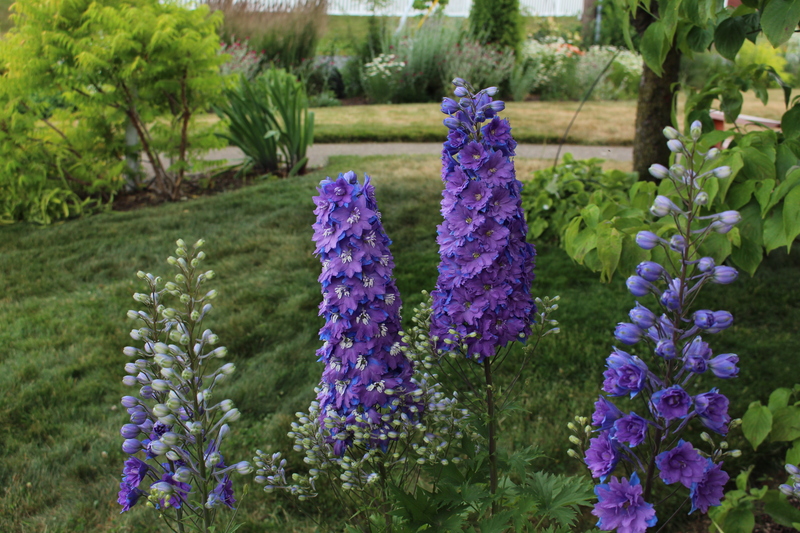 My garden has lots of delphinium because they seem to pop up in other places around the garden. I have a few clumps like your blues, but just like what happened to them, mine are now in a vase. Too heavy a flower head. We did not get rain, but wind. I find the delphinium in the lily, iris, boxwood bed are the ones to weather a storm. Those tall lily stems keep them up. The delphinium in the front garden is helped by the Shasta Daisy ‘Alaska’, but they fall eventually too. 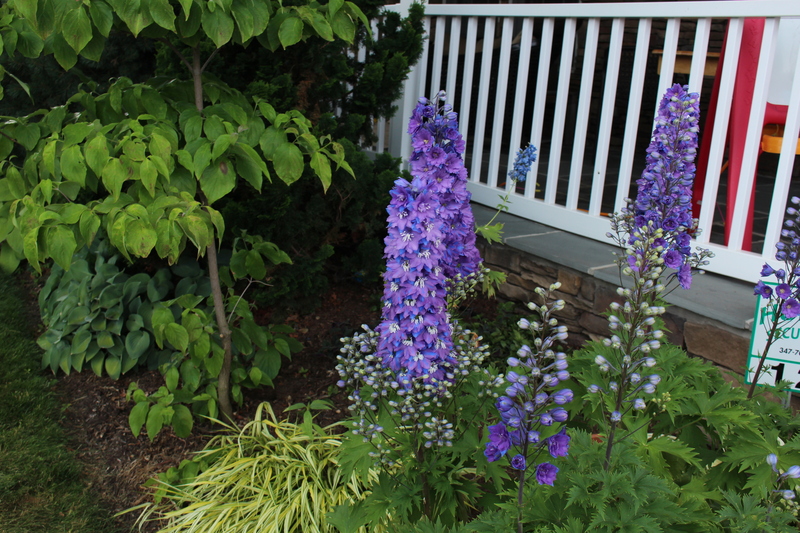 The native delphinium is also lopsided now after the strong wind. Rain did the clump in, so goodbye to my lean and mean growing theory, but like you said, they do just fine in the vase. beautiful delphinium; I think you should be kinder to it and give in to its needs! Look how it repaid you last year! Next year they will get some attention. For as much as I like tough-love and plants that take care of themselves, I do like a flower to look happy in the garden, and not plain miserable with it’s fate!